This fact seemed particularly relevant last week when the President of Liberal International presented the 2011 Prize for Freedom to Dr Chee Soon Juan of the Singapore Democrat Party. That award was noteworthy inasmuch as, unlike in the cases of other Asian members of CALD awarded this prize, such as Aung San Suu Kyi and Sam Rainsy, it has been even harder to establish what Dr Chee has been up against, because of the far more subtle ways in which the Singapore government stifles dissension. Sadly even some Liberals, and various indices that set themselves up to measure freedom, ignore political and social freedoms. Given the immense economic development Singapore has evinced under its authoritarian leadership, it is sometimes presented as a model for what can be achieved without democracy in the fullest sense. I am grateful then to the President of Liberal International for so simply making the point that Singapore would have done even better had it also enjoyed more freedom. But, having said that, one wonders whether it is true, or even plausible. As noted, some countries developed under dictatorships. And there are also examples of democracy not promoting development, most obviously to me Sri Lanka, in the first thirty years after independence. To you, similarly, the recent experiences of Greece and Italy and Ireland, to name just a few, suggest that democracy can also contribute to economic decline – and the determination of other leaders that Greece should not have held a referendum with regard to austerity measures proposed is perhaps the clearest evidence that democracy is not always trusted by those concerned with economic progress. Nevertheless, even if the two are not necessarily bound together, there is enough evidence of symbiosis, not only in the way the West developed, but also more recently in the examples of Japan and India and Indonesia. And the destruction wrought by most dictatorships clearly outweighs the positive achievements of a few. More tellingly perhaps, with regard to these latter, we can see that sustaining development demands openness to new ideas, which is why we should register the internal democracy in countries like China and Vietnam, which will save them one hopes from the stagnation that the Soviet Union experienced when ancient leaders out of tune with the modern world stayed on in power. 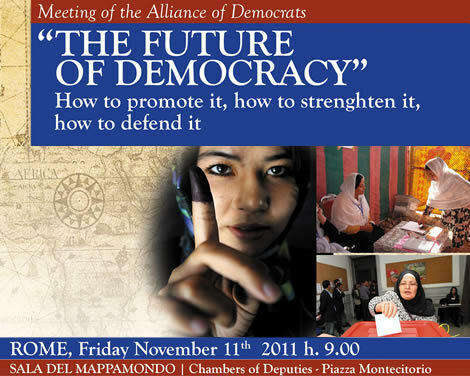 This prompts another thought that may help to fine tune the relationship between democracy and economic development. That is the need for development within democracy itself, the need for new ideas to emerge and lead to new structures and practices. Continuity can corrupt, as we have seen so graphically illustrated in the Middle East this year, but also in Europe, where despite democracy the government in several countries simply seemed the mixture as before. The United Kingdom suffered from this in the decades before Mrs Thatcher wrought a revolution, and facilitated economic progress where there had been unremitting decline for years. I suspect the United States too will see a need soon for radical change, given how sadly the promise of Obama’s election has yielded to the perception, which may be inaccurate but is still powerfully experienced, that he is a prisoner of an elitist status quo. The irony of all this, in terms of our topic, is the manner in which Europe, and the United States too, are wooing China to obtain financial support. Putting it crudely, it would seem that democracies are unable to cope with the demands of their voting population for greater indebtedness, and the solution has to come from a country criticized for not being democratic. Of course there are other ways of looking at this situation, one of which I have noted in suggesting that democracy is also about pluralism and sensitivity to wider needs, without perpetuation of advantages to those groups that control state policy. The recent spate of demonstrations may be another way of expressing this need, to look also at the interests of those who feel state policy ignores them. Democracy after all means the power of the people and, while voting may seem a prerequisite to ensuring this, it is often not enough. Decent education, equality of opportunity, wider understanding of particular needs, also contribute to empowerment as well as the sense that one is not powerless, which is also vital. The despair of those who feel democratic structures will not prove responsive to people’s needs, given the power commanded by a perpetually dominant elite, may find a parallel in those in newly democratized countries who are suspicious of the motives of the West for promoting their cause. We have been through the establishment of client states before, horrendously Bokassa and Mobutu, but also characters like Idi Amin and the Shah of Iran, of whom it is now almost forgotten how they came into power by overthrowing democratically elected leaders. The unseemly scramble for contracts in Libya after Gaddafi was overthrown will be remembered, and may contribute to prejudices about democracy and its appeal to the West, if it is seen to be promoted only when it serves external economic interests. This is why it is important for bodies like this to be both consistent and careful. The promise of newly emerging democracies should not be betrayed the way Afghanistan was, leaving it prey to corruption and patronage when other countries to overcome seemed of more immediate concern. Similarly, there should be concentration now on what can be put into Libya, not what can be taken out. The aim of democracy in any country should be economic development in that country, first and foremost, not economic development or rather exploitation for others. I believe there are more idealists now, more people with greater understanding of other countries. But we owe it to ourselves to be vigilant about the motives of those who work in a good cause, and to study the outcomes of interventions and even simple involvements. Collateral benefits to oneself should never be taken for granted, and questioning is essential when these do not help in empowering the people they are supposed to serve.